The above quote sure sounds like Humanism to me. Plus, according to the Religious News Service – Sanders is unabashedly irreligious. He identifies as culturally Jewish but not religiously Jewish. (http://www.religionnews.com/2015/04/29/5-faith-facts-bernie-sanders-unabashedly-irreligious/) He dislikes bible thumpers and was given a zero score by Ralph Reed’s Faith and Freedom Coalition. To sum up, he appears to be a progressive individual, who without religion feels we have the ability and the responsibility to lead ethical lives of personal fulfillment that aspire to the greater good of humanity. 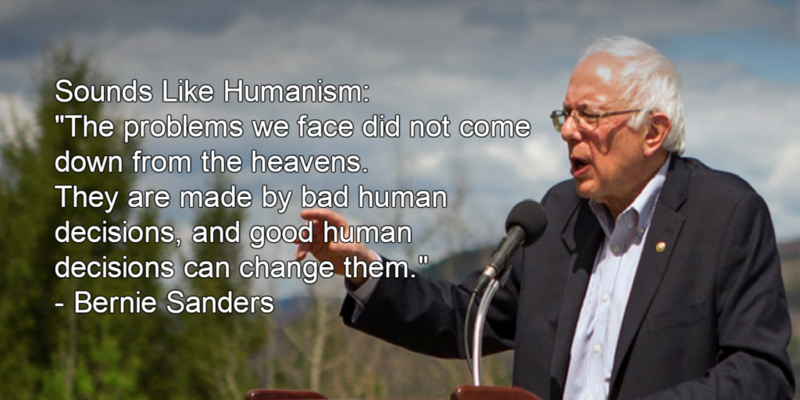 Yeah – sounds like Humanism to me.